Technical information is now available on the MOT testing service, the DVSA has announced. 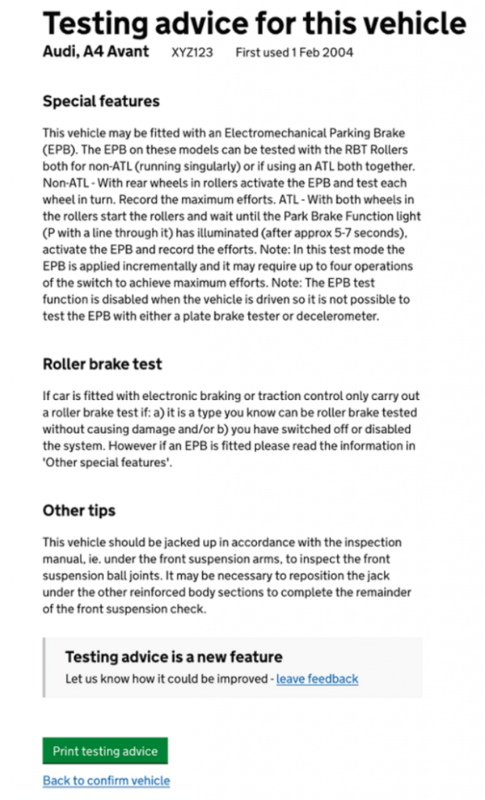 The update covers steering and suspension design and tolerances, special features, such as how to put an electromechanical parking brake system into bedding mode before roller brake testing. The data also details unusual features, such as testing certain vehicle types with the ignition off to ensure that the brake servo is fully charged as well as safety design features and other useful tips, such as how to jack up some vehicles with air suspension. On the Matters of Testing blog, the DVSA’s Danny Charles said: “This first version has advice on how to test around 20 per cent of vehicles. “But the way we’ve built this feature means that we can add to it quickly and easily. Testers will now see a new banner with a link to ‘testing advice’ on vehicles where there is technical information available. ouncement, one tester commented: “Great to get tips on testing with the ever-expanding model range with crazy electronics and especially EPS, ABS, TRC, VSC, DSC, start-stop. However, some have mentioned issues when registering and entering results. Michael Brown said: “Anybody else having issues when you log back on to put results in, that it keeps kicking you back to the start test screen, not all the time. “It’s happened to me loads since the last improvement, twice when I am about to print off the certificate it kicks me out and I have to issue a duplicate due to loosing the end page also when you are putting brake readings in. “It also puts me back to the start test page? The DVSA has said it is aware of these issues and that it is “working to address them”.